Common Core State StandardsTexas Essential Knowledge and Skills (TEKS)Virginia Standards of Learning (SOL) BC Performance StandardsAlberta Program of Studies The National Curriculum (Wales)Curriculum for Excellence Benchmarks (Scotland)Curriculum for ExcellenceProgramme of StudyMinimum Content The Australian Curriculum (ACARA)The Victorian Curriculum (F-10) Can't Find Your Standard? Students will be able to identify their home phone numbers. Ask students if they have ever used a telephone, and then ask if they know their home telephone numbers. Explain that a PhoneIs a device that can be used to contact family and friends to keep in touch. Tell the students that a phone can also be used in case of an emergency. Inform your students that today they will learn their Home telephone numbers, which give them access to their parents or guardians in case they are ever in trouble. Show the students the numbers 0 through 9 on flashcards out of numeric order. Have the students call out the numbers collectively as a group. 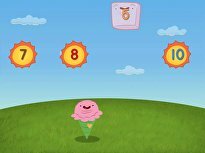 Ensure that all students are able to master the numbers before proceeding. Show the students a touch-tone phone. 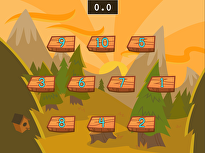 Inform the students that a telephone number is made up of 10 numbers. Inform the students that the first three numbers are the Area code, which distinguishes a geographic area. Tell the students that the last 7 numbers of their home telephone numbers identify the unique phone number that belongs to their families. Write a phone number on the whiteboard. Have a student come to the front of the room and dial the phone number on the touch-tone phone. Provide each student with the My Phone Number worksheet. Call out various phone numbers, and have the students practise dialing on their worksheets. Next, provide each student with their home numbers written on a slip of paper. Have each student write his number on his worksheet. Check to make sure the phone number is copied correctly. 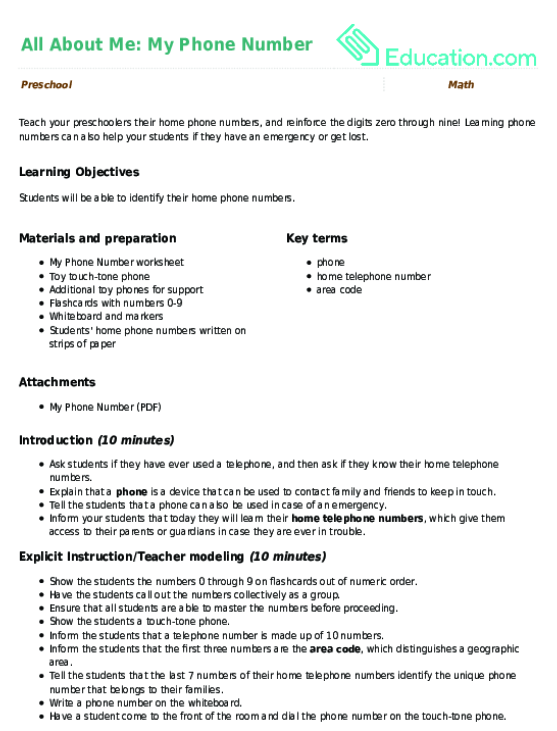 Have the students practise dialing their home phone numbers on their worksheets. Instruct them to work in pairs and exchange phone numbers with a classmate. Enrichment:Encourage your students to record the phone numbers of all their friends in the classroom. Support:Give the students a toy phone to make the activity more realistic and meaningful. Alternatively, provide phone numbers without the area code, and add the area code once the 7 digit number has been mastered. Conference with each student, and ask him to recite his phone number. Have the students recite a phone number from the whiteboard. Ask a volunteer to come up and press the numbers on the touch-tone phone. 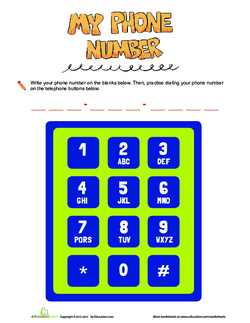 Teach your preschoolers their home phone numbers, and reinforce the digits zero through nine! Learning phone numbers can also help your students if they have an emergency or get lost. Can your preschooler recite his phone number? Use this cute template to help him learn an important bit of information. 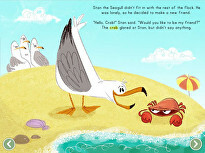 Show your preschooler all there is to know about the number seven. 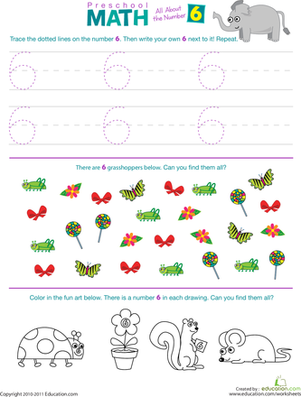 This colorful worksheet will have her counting, writing, and identifying all things seven. 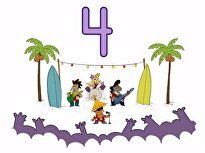 This third step in the number series introduces your preschooler to the number three. It'll have him writing, counting, and identifying the curvy number. 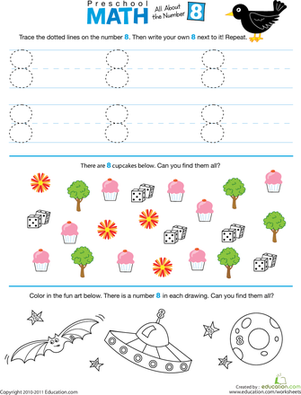 Get your preschooler counting, identifying, and writing the number 9 in no time with this great number worksheet! 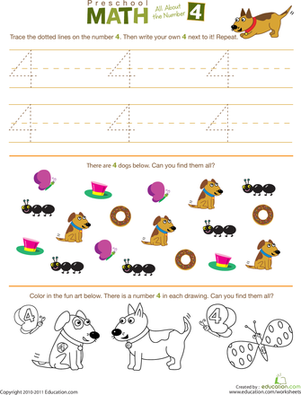 This cheerful worksheet encourages your preschooler to try her hand at the number ten, giving her practise with writing, counting, and identifying the number. 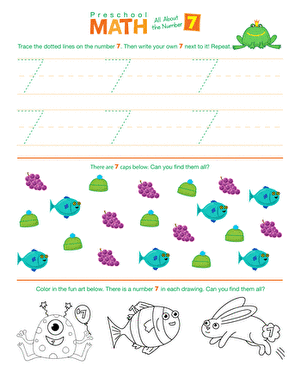 Dive into kindergarten maths with this colorful worksheet that explores the number four. 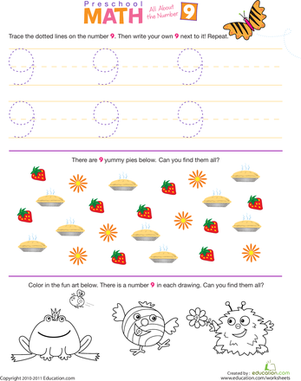 Explore numbers, specifically the number five, with this colorful kindergarten maths worksheet. 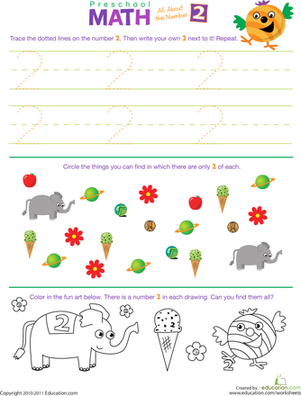 Your preschooler will enjoy getting familiar with the number two when it involves this colorful worksheet! 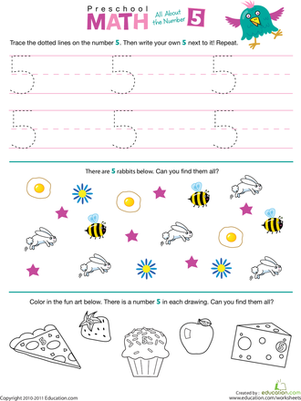 Get your preschooler to explore numbers with this fun worksheet that packs in coloring, counting, writing, and identifying the number six. 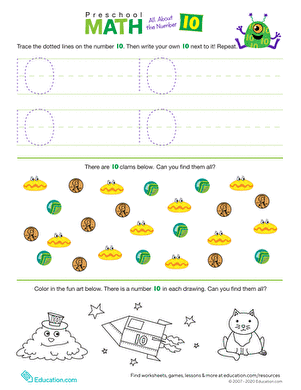 This colorful worksheet takes it slowly, giving him a thorough lesson on the number eight. 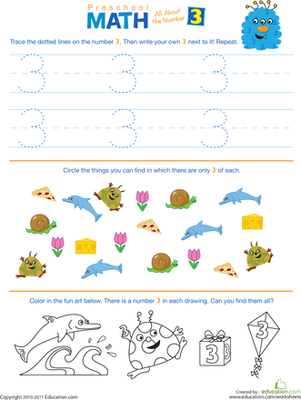 Have some fun making your own puzzle with this printable all about the number three.